Clover has many themes, some of which come included with the Clover installer but different themes, sometimes more up to date and better themes, have otherwise been listed in the Clover wiki with a download link to find the files. Not all themes can be included in the Clover installer as their many files make them large in file size and the installer would be unnecessarily bloated. Because of this, it's been decided (soon) to move all themes from Clover's source repository and instead host them in a new specific theme repository at sourceforge, next to the Clover repository. This will result in a smaller Clover repository allowing for faster check out of the source and downloading of the Clover installer quicker. Clover with still have it's own very simple embedded theme so users installing without a theme will not be left in the dark. If updating from a previous version fails then please download the new version from the bottom of this post. Please take note. To get themes from the new Clover theme repository you will need to have git installed. It started out as a simple app which displayed a list of themes in the repository and gave you the option to download and install themes to your /EFI/Clover/Themes directories. It's since grown with the aim of becoming more of a manager app by reading the Clover bootlog to determine what happened last boot and offering a set of options to change the theme for next boot depending on your system. On launch, the app will attempt to read your boot device and use your boot device. If this device uses an MBR partition then the app will ask for your password so it can run fdisk to match the device. If your boot volume is an EFI system partition and it's currently unmounted then the app will ask for you password to mount it. What happens if a theme designer updates their theme? The theme manager can check for updates to themes and notify you giving you the option to update your installed version. I no longer want to use a theme. You can simply remove installed themes by clicking the UnInstall button. I have created a theme. How do I add it to the repository? 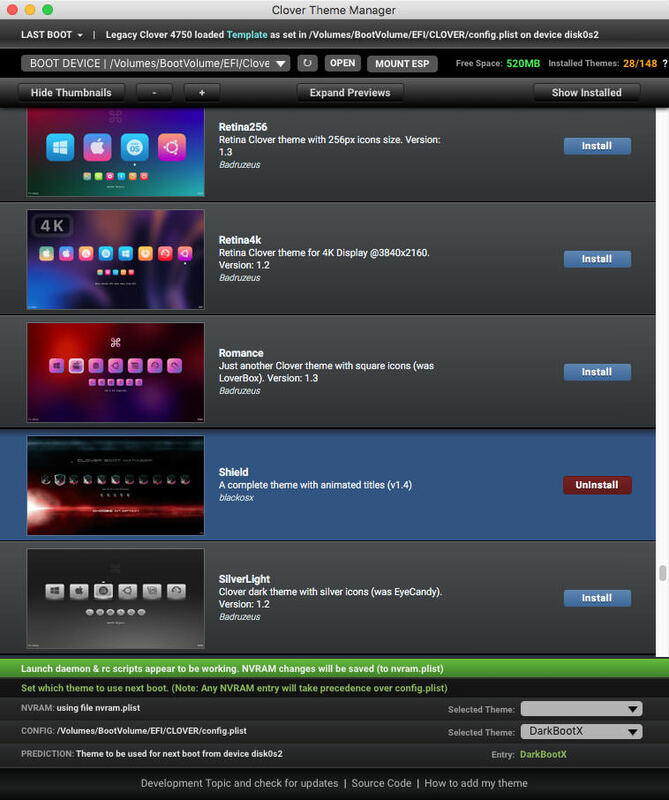 Theme designers can have access to add and amend their themes for anyone else to install and try out. Step by step instructions can be found by clicking the 'How to add my theme' foot link in the app. What does the Clover Theme Manager app install to my system? Where’s the source code for the app? The app is based on the objective-c macgap (MIT license) with a couple of modifications by me. The web view presented by macgap is where I effectively run a web app which communicates back and forth with a bash script which is initially launched by macgap when it’s loaded. The Clover git repo has been setup by apianti. Thanks to apianti, dmazar, JrCs, SoThOr and Micky1979 for their help. Thanks to alexq, arsradu, asusfreak, Badruzeus, chris1111, droplets, eMatoS, kyndder, mnfesq, oswaldini & SavageAUS for testing. The application has been in development for a few months now and while I think it's pretty stable I can only test on my systems and respond to the feedback of others so there may well be bugs and issues yet to be squashed. If you wish to try out the application then please report any feedback, both positive and negative here. Note: If you are reporting any problems then please supply a description of the problem, a screenshot and attach a .zip of the /tmp/CloverThemeManager directory (available only while the app is running). Can I download themes without using the CloverThemeManager app? Yes, you can manually manage your own /EFI/Clover/Themes directories yourself as you may currently do. Very nice. Way to go blackosx! Thanks for the feedback Onixs. Good work blackosx! as always! I'm going to test and report back.. I" m getting repository error..
No rush - when you have a chance. Can you please run this command in Terminal? The result of this determines whether or not the script continues as if there's no current connection to the repository then there's no point in continuing. Beautiful app! I notice that in the menu options in the menu bar the app is referred to as MacGap. Probably an oversight, yes? Also, it would be nice if the app could allow you to mount the EFI partition since that's where my themes are installed. Lots of features do not work unless I first mount that usually hidden partition. So, I mounted the EFI partition and selected it and then the app got stuck loading the partition. It's been loading for about 10-15 minutes. I closed the app and retried. The same thing happened. Not sure where to go from here. Droplets reported this problem to me at projectosx. I hope to have fixed this now. - Fix bug when reading empty pref entries for last selected volume and path. Please can you try v0.69 attached in the first post? Yes, the app is referred to as MacGap because it's built using that. TBH, I don't mind and was happy to leave it as that as it shows it's roots. However, if this may cause confusion then I could look at making the change. Thanks for the suggestion for getting the app to mount the ESP. I could look at doing that if the demand is high enough for it but for now, as you have found out, any volumes with an /EFI/Clover/Themes directory needs to be mounted before launching the app. EDIT: didn't see that.. " For now you will need to have Xcode developer tools installed as git is required for this to work. - You will also need to have any volumes with your /EFI/Clover/Themes directory mounted before launching the app. Yes. asusfreak at projectosx highlighted this. Still having the same problem. Once I select my EFI partition, it continues to try to load without success. I happen to have several config.plists in my clover directory. Might that make a difference? Right now, I am running Yosemite after having booted with config2.plist. Or does it just look for the themes directory? Note. It will only be available while the app is running. If you quit the app then the file will be deleted. Good job! Gonna try that. I've updated the app to v0.70 and also added a requirements notice at the top of the opening post. The app now looks to see if git is installed on your system and if not, displays a dialog box with the same instructions as I have put in the requirements notice. If there are other places I should check for git then please let me know. If anyone without git installed tries it (C.Frio?) then please report if the script correctly catches the problem and handles it decently. Don't housekeep prefs and theme.gits for Volumes that are no longer mounted - For example, an unmounted ESP. Great. Thanks for reporting back C.Frio and no problem with not trying everything. I'll try to fix any issues as they arise and currently have mnfesq's issue still to check. I'll find out more once he's posted his log file. This was using version 0.71. All seems ok, but I can suggest to find ESP mount points even if they are named differently from 'EFI'... like /Volumes/ESP? @mnfesq - Thanks for the log file. I didn't get a chance to look at anything last night but I will have a look today. @mickey1979 - Thanks for your testing and log file. I'll look in to adding support for mounting and working with /EFI/Clover/Theme dirs on ESP's. Thanks for your log file mnfesq. It helped identify the issue which I now hope to have fixed. @mickey1979 - I have not looked at your log yet but will later. - UI theme dir dropdown list now used values of array ID. - Record and use mount points from diskutil info -plist. - Handle spaces in mount points. - Assign zero’d volume UUID for MBR partitioned devices. - Send update list to UI even if no path selected to enable interface. - Add debug info to log for $PATH and result of which command. - Fix bug where incorrect theme would be removed from prefs. - Various code clean ups. New version of the app is in the first post. I hope this is helping you and that I'm not being a pain in your backside. - Add showing/hiding previews for update theme bands. Thanks for the report mnfesq and no problem - It's good to get feedback. ~/Library/Preferences/org.black.CloverThemeManager.plist and the ~/Library/Application\ Support/CloverThemeManager directory and then re-launching the app? Does the app launch at all without your ESP mounted? ...and the /Volumes/ESP was correctly found! OK, I deleted the folder in application support for Clover Theme Manager and restarted (using version .73). It still didn't work. I also tried to mount an EFI partition on my USB installer that has Clover installed on it. I couldn't get that partition to load either.